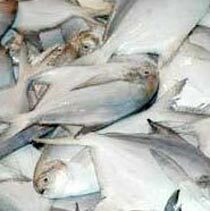 The company is enlisted among the topmost Manufacturers and Suppliers of Frozen Pomfret Fish in Karnataka, India. Our Pomfret Fish is quality tested by controllers to ensure excellent quality. We package Frozen Pomfret Fish in high-grade packaging material to package them in order to keep their freshness intact for longer duration. Our Frozen Pomfret Fish is available at the best price in the market.